Hi, I’m Rebecca Hogue, and I’m a blogger, a scholar, an educator, and aspiring writer. For the purposes of this presentation, I’m my unaffiliated self. Last week I participated in an interesting discussion about EdContext – Educators across context on Connected Learning TV. One of the comments I made was a challenge to the traditional academic bio. When I was a PhD student, my bio was pretty standard – “I am pursuing a PhD in Education from the University of Ottawa”. Simple and standard – name, position/rank, and affiliation. I’m now in a very odd position. I’m a PhD candidate, but I’m on medical leave – so technically I’m not a student. I’m also not currently teaching (although I expect that to change in September). And if I were teaching, it would not be at the same university where I’m doing my PhD studies. The standard name, position, and affiliation doesn’t make sense. I have intentionally tried to use the term unaffiliated; but some conference organizers were challenged by that. 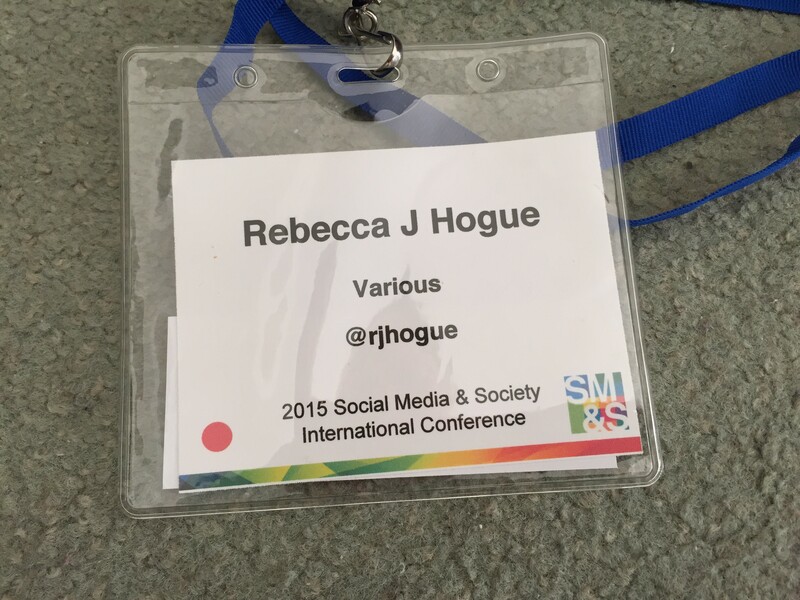 At the latest conference, my unaffiliation became Various. The traditional academic world is challenged by the new breed of academics. Those of us who are trying to eek out a space in a world where tenure track positions are few and far between. In some ways, this desire towards the standard bio of name, position, and affiliation is a way in which the current situation in higher ed is ignored. It also goes to promote the status quo – a system that is need of a shake-up. The academic world is all about prestige, and that prestige comes with the brand that is a university affiliation. However, the world is changing. I’m a non-traditional student. I’m also someone who is not afraid to rock the boat if I feel like it needs rocking. In the academic world, where more and more people are parttime contract workers – often taking teaching positions at multiple institutions at the same time – the traditional bio just doesn’t make sense. At some point, I might be affiliated with three or more institutions of higher learning – and yet, I would not belong to any one of them. None of them would be an affiliation that I would be obligated to promote. Nor would I want the chains of an affiliation to bind me. There is a form of freedom that comes with being unaffiliated. The biggest freedom is that of not being bound to research ethics boards. It isn’t that I do unethical research – I am highly aware of the ethics of doing research. I just find that too many ethics boards are self-serving bureaucracies which put in policies to make their own jobs easier while making the actual research less ethical (don’t get me started on consent forms that are written in a manner that only makes sense to ethics boards, and ensure that participants won’t read them – (un)informed consent). And so, when universities are paying me to teach classes, but not paying me to serve on committees or do research, I am left with choice. I am doing things on my own time, with my own money, I can choose how I wish to spend that time and money. I’m affiliated (but only loosely) with multiple institutions, I have some freedom to choose which I wish to represent – or I can choose to represent my unaffiliated self. I am still left with the struggle of the bio, and the struggle with how to introduce myself in an academic setting. 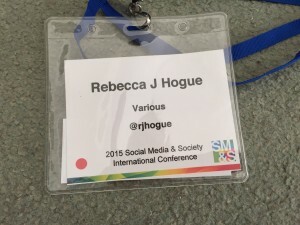 Over the next few months I have several conference presentations to give, and with each I struggle with how to introduce myself and how to complete the “bio” information for the conference website/proceedings. I am independent. I value the independence, despite some “drawbacks”. I have found it entertaining to subvert “professionalism” by presenting what might be termed leisure as central to who I am, and adding my main work as an afterthought. For some it is refreshing, others see it as arrogant and patronising. The issue in the end is the extent to which your audience actually buys into or has bought into (did they pay to hear you) the narrative of “academe”. We all have our narratives though. Interesting. And even when you are affiliated with an institution (in my case, not as an academic, but a secondary school teacher librarian) you don’t always want your online writing to be affiliated with your institution. I am definitely not representing mine although my principal is fine with me expressing my own opinions.